Ten Dominican Nuns of Summit to Attend Closing Papal Mass!!! In a series of events that could only point to the loving Providence of God, 10 of our sisters will be attending the closing Mass at Yankee Stadium on Sunday, April 20th. 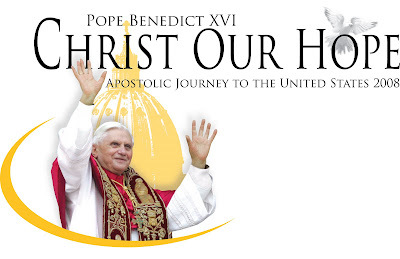 When we heard the news of the Holy Father's Apostolic visit none of us thought we would be able to go to any of the events taking place during his pilgrimage. After all, we were in Jersey. The Pope coming specifically to Jersey was probably a never to repeated occurrence!! A chance remark to a priest friend by one of the sisters on the number of tickets he was able to get for his parish up in Massachusetts led to his suggesting that perhaps he could get some tickets for the sisters. After all, his brother was in charge of ticket distribution!!! It was a remote chance but he'd see what he could do! It was nearly the last minute but the call came, "Get the names of the sisters to me by tomorrow!" Later, when two sisters cancelled, we found out that 6 sisters from the Slaves of the Immaculate Heart of Mary would be able to come down to NJ and travel with us to the Papal Mass. For the 6 sisters in the novitiate the opportunity to attend the Holy Father's Mass, to be with him and show him our support, is just awesome beyond words! They never dreamed that in giving up all things to follow Christ, He truly does reward with the hundredfold! One sister in the community said, "It's not that we are going to SEE the Holy Father. If that were the case, we would stay home and see a lot more on television. We're going to BE with the Holy Father, to pray with him, to show him our love and support, to unite with a part of the Mystical Body of Christ in this corner of the world, and to be a witness to the joy of consecrated life." At about the same time that we got this good news, our monastery, along with all cloistered monasteries in the US, received a letter from the Papal Nuncio, Archbishop Pietro Sambi, requesting that each nun adopted a specific event of the Holy Father's visit and make it the object of our prayer and penance. So, "holy cards" bearing the official logo (as above) were made each with a different event from the Holy Father's itinerary, and each sister chose one at random at Easter. It is our hope that our prayer will bring many graces to our country as we prepare to welcome our Holy Father, Benedict XVI. Straight from the Holy Father! We Can't Wait for You to Come!